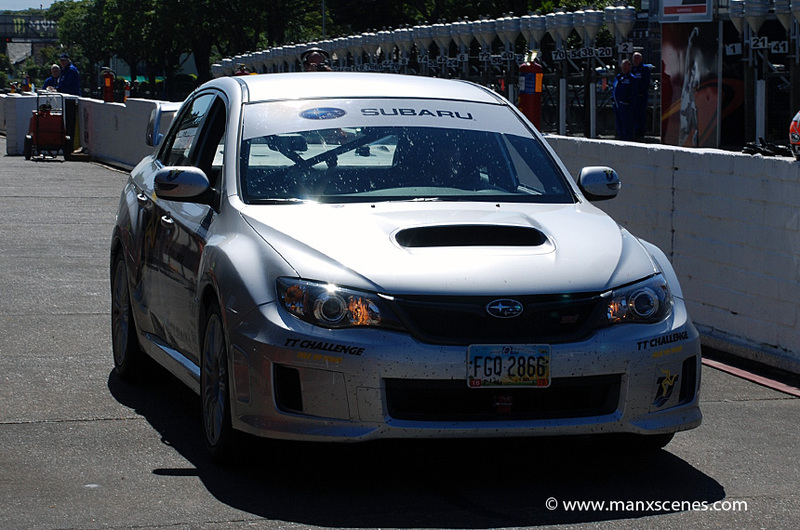 Mark Higgins’ lap around the TT course in a Subaru rally car today (Monday 6/6/11) turned out to be a very convincing way of how to break Tony Pond’s four-wheel record for the TT Mountain course. The Manxman completed a circuit at an average speed of 113.505 miles an hour, easily beating Pond’s 1990 effort, when he clocked 102. I captured this picture of the Scooby returning up Pit Lane in the TT Grandstand after smashing the record. The image was taken on my Nikon D80 SLR with a Nikon 18-135 F3.5/5.6 G AFS DX lens at 48mm and cropped in Adobe Photoshop CS5.